This is a strong mid-'90's hip-hop album from two Jerseyites with a fairly unique style, B-boyism mixed with EPMD-esque funk flavor. 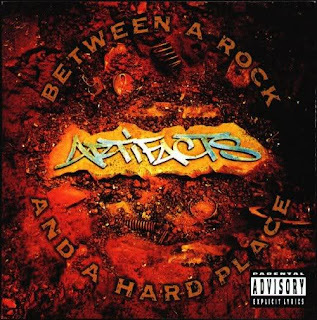 Hard-edged but not gangster, the Artifacts stress the true elements of hip-hop culture in their music with an accent on their forte, graffiti writing. Calling their debut album the "the first and last showing of graffiti rock," the Artifacts rap about typical subjects like marijuana and skirt-chasing, but their cleverness and wit are singular. Tracks like "Wrong Side Of The Tracks," "Flexi Wit Da Tech," and "C'mon With Da Git Down," are arguably '90s underground classics, while other tracks, like the Redman-produced "Comin' Through Your F****n' Block" and "Wassup Now Muthaf****" also hit hard. The synoptic track "Whayback" is a shout to rap's forefathers and a longing for hip-hop's glory days of old. Although slack in a few places, overall, this a stellar album and sincere attempt to keep the essence of hip-hop alive.